So, Would You Eat A Panda? : 13.7: Cosmos And Culture New research suggests that big-game hunting was part of our past for 2 million years. But according to commentator Barbara J. King, our history as meat-eaters can't explain why we find some animals delectable, like chickens and pigs, and eating others out of the question. 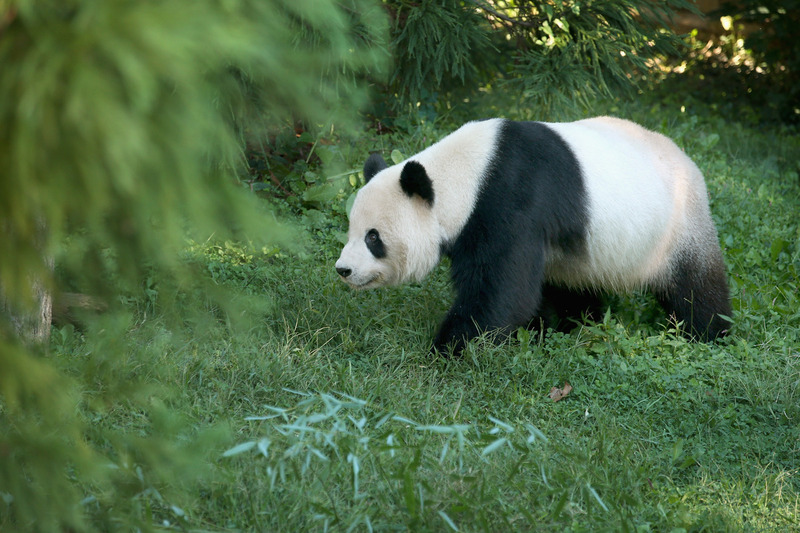 A Chinese scientist recently suggested that prehistoric humans ate pandas. The evidence, based on cut marks on panda bones, strikes me as thin, but the report led me to a thought experiment. How would people in the modern world react if the some population or subculture today made panda-foraging a goal? I imagine most of us would be horrified, and not only because the panda is an endangered species. The panda has become a symbol of cuteness, an animal we love to love. Although some pretty neat research is underway seeking a genetic substrate for certain taste preferences, anthropologists know that what people choose to eat and what we find out of the question to eat is a deeply cultural matter. What we consume is bound up in a specific time and place with family, tradition, and ethnic identity in complicated ways. Many of us can probably remember a time when, traveling far from home, we felt incredulous at what foods people around us were eating with nonchalance — or with lip-smacking enthusiasm. Years ago, newly arrived in Gabon, West Africa, and about to study captive chimpanzees, I dined at a small rural restaurant. Selecting chicken from the menu, I was urged to try another dish: monkey. I couldn't imagine eating a monkey! I was after all, devoting my professional life to observing monkeys and apes, whom I knew to be thinking and feeling creatures. When my chicken and French fries arrived, I discovered coarse black hairs nestled among the food. Part of the monkey had slipped onto my plate after all. I picked out and discarded the monkey hairs. But I ate the chicken without a second thought. These days, I couldn't eat that chicken any more than I could eat the monkey. Although not in ways as complex as primates, chickens do, science tells us, think and feel. I still very occasionally eat fish. And I seem to have a harder and harder time understanding how any of us draw the line about what we will and won't eat. In the same way that panda-eating wouldn't be acceptable to most of us in this country, there was outrage expressed when a Colorado restaurant put lion on the menu for a special event. The lion was soon enough removed from the menu, but other exotic species such as kangaroo and water buffalo were not. So what is it about lions and pandas — and cats and dogs? What keeps these animals off our dining tables, when we readily consume, say, pigs and chickens? And we don't just eat pigs and chickens, we rhapsodize about eating them. In last Sunday's Food magazine of The New York Times, Mario Batali wrote blissfully about the odd foods he encountered on a visit to Tokyo, ranging from pork uterus to chicken kneecaps, using words like "exciting" and "heavenly." Of course, I'm generalizing. Millions of vegetarians and vegans don't eat chicken kneecaps, or any other part of chickens, turkeys, pigs, lambs or cows. I don't either. People in that category hope, for the animals' sake and for the sake of human health, that people lucky enough to have an economic choice in the matter will eat less of these creatures or none at all. So are we non-meat-eaters bucking cultural tradition, and forging a new identity based on what we don't eat instead of what we do eat? We're not just non-panda-eaters, like everyone else. In this country, at least, we are still an anomaly, and an evolutionary anomaly at that. In the Homo lineage, according to new research by anthropologist Henry Bunn on our hominid ancestors from Olduvai, Tanzania, we've been big-game hunters for longer than I'd ever thought: about 2 million years. We've been eating meat for longer than that, via scavenging or taking small game opportunistically. Our evolutionary history, though, cannot explain what each of us finds delectable or disgusting today. And it shouldn't, and doesn't, define our dietary choices, either.